Thanks to the lovely Kio, Félix Fénéon's collection of faits divers, Novels in Three Lines, is now available to the twenty-first century reader in serial form, so now you can experience them as Le Matin readers did a century ago. See the Twitter feed. 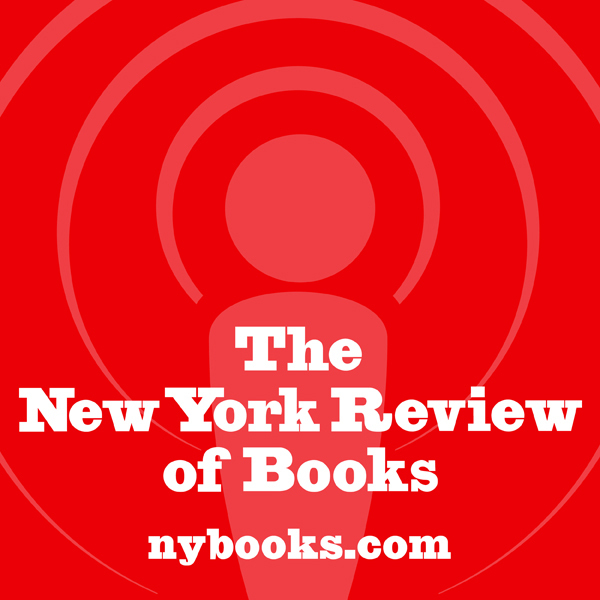 The New York Review of Books has started podcasting. So far, podcasts have featured interviews with Mary Beard, Edmund White, and Robert Barnett—each discussing their articles in recent issues of the magazine. Subscribe through the itunes store. And if a subscription is just too big a commitment for you, you can also become a fan of The New York Review of Books on Facebook—the podcasts are all fed to the page. There's also a brand new NYREV fan group. 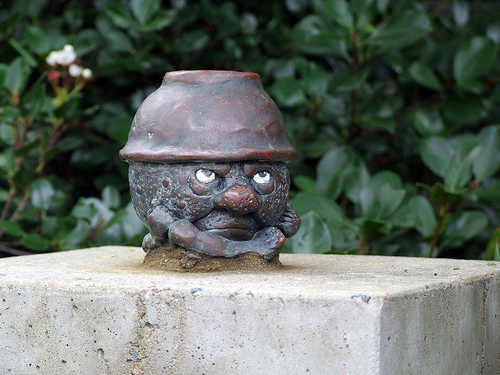 So, in the words of our favorite New York Eccentric, "SIGN THE PETISH-SHUN!" (an order which has become for us, a general phrase to be used whenever one wants to put pressure on anyone to join any sort of group). Ramona Koval: Peter Carey, finally, what is The Magic Pudding doing in the book? It's a favourite of Hugh and Marlene's; is it a favourite of yours too? Peter Carey: I do love The Magic Pudding. I think everywhere...and I've travelled around a lot and I seem to lose my copies of The Magic Pudding and get new ones, and the truth of the matter is things find their way into your books because...a word might come into a book because of something someone said at dinner last night and it isn't the dinner that you're interested in it's the word and you pick it up and you love it and you use it, and The Magic Pudding I was rereading when I was writing the book. But Hugh does seem very much...I do think The Magic Pudding is one of the great Australian works, and Hugh somehow seems to fit...Hugh having an affection for The Magic Pudding just seemed right to me, and there are things that it just gives you an excuse to celebrate and put in the book that said something about Hugh's character, it celebrates the book, it's a very distinctive Australian book which I love. The post about the film version of A Month in the Country neglected to mention one of the most appealing things about the production, that the screenplay was written by playwright and memoirist Simon Gray. Gray's Smoking Diaries is one of the most engaging first-person narratives we've read in the past few years. 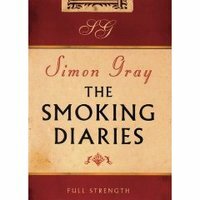 And now it appears that a third volume of these "diaries," The Last Cigarette, was released in the UK the other month. It features an attractive trompe l'oeil cigarette-box cover (as the first volume did). "So here I am, two hours into my sixty-sixth year.... The truth is that I'm nastier than I used to be back when—back when I was sixty-four, for instance, when I was nastier than when I was at sixty-two and so forth, back and back, always the less nasty the further back, until I get to the age when I was pre-nasty, at least consciously, when the only shame I knew was the shame of being found out, which was when I was, well, about eight, I suppose." I wonder if Da Capo will release the book in the US as they've done with the other volumes. If they do, perhaps they'll drop the misguided cover they chose for volume one—which appears to show the author at a carnival, posing before a cardboard cutout Rousseau painting. Envy those University of Minnesota students who have the opportunity to take a class titled "The Old Weird America" from the man who coined a term that has come to define everything from aesthetic categories in music and art to that feeling you get when driving past burnt-out barns along the highway. "This course examines commonplace, authorless songs as elemental, founding documents of American identity. These songs can be heard as a form of speech that, with a deep foundation, is always in a flux; especially in the work of Bob Dylan across the last fifty years. Reading includes novels (Colson Whitehead's John Henry Days; and Lee Smith's The Devil's Dream, criticism (Constance Rourke's classic American Humor ), Bob Dylan's autobiography Chronicles, as well as music and film excerpts." 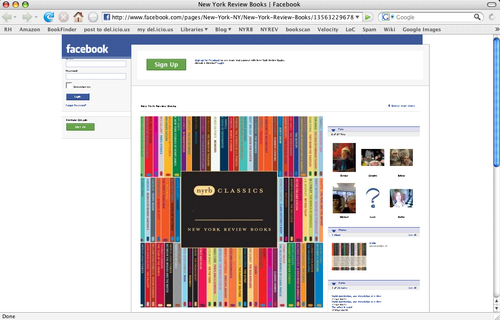 The NYRB Facebook page is here. Come say hello, or send in a picture of you or anyone reading a New York Review Book. There might just be something in it for you. The site Well-Mannered Frivolity points us to Unesco's magnificently named Index Translationum, which attempts to catalog all books in translation everywhere (or at least among its hundred-odd member states), a Borghesian task. Our own Georges Simenon comes in at #16 on the list of most translated writers, with 1,959 translated books to his name. He's right after Isaac Asimov and just before Pope John Paul II. 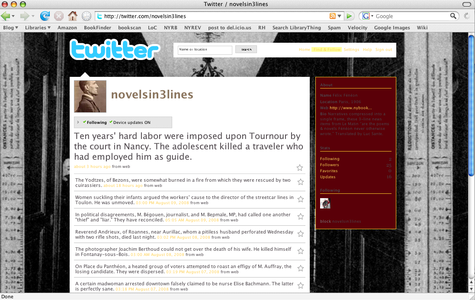 The index is worth looking at, and the Translationum database could proove be a very useful resource, indeed. As Ms. Well-Mannered Frivolity comments, "Authors who write prolifically have a distinct advantage here," which explains why Barbara Cartland outranks the New Testament. 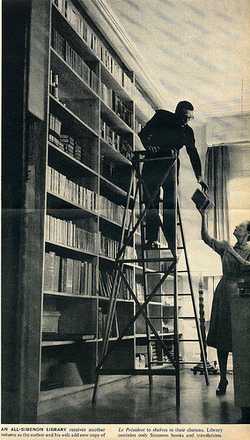 The photograph above shows M. Simenon (for once without his pipe) adding another volume to his "all-Simenon" bookshelf. 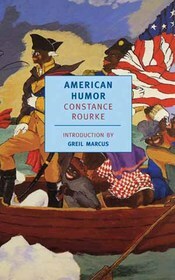 2009 will be the 40th anniversary of the Booker Prize (the first awardee was P.H. Newby's Something to Answer For). To drum up interest in the award, and because the only thing better that a best-of list is a best-of-the-best list, there will be a "Best of the Booker" prize given to one of the 41 former winners. As the Man Booker site notes, this isn't the first time such a prize has been distributed, in 1993 Salman Rushdie's Midnight's Children was deemed the best by a panel of judges. Democracy has swept the world, and what worked 1993 surely won't work for the Web 2.0 generation, so this time, the panel of experts is selecting only the six finalists for the "Best of the Booker" prize. The public will be making the final choice. ABE.com is holding its very own, early poll. So if you'd like to vote for NYRB's lone Booker winner, head over to its Booker page, and put your support behind J.G. Farrell's Siege of Krishnapur. his writing remains fresh and hilarious. the hands of persons not in robust health. have written Alice in Wonderland than the whole Encyclopaedia Britannica. How beautiful he looked! Not tall like Alexis Alexovitch, ah, no! 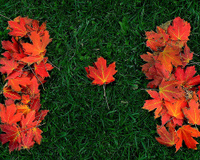 but so short and wide and round—shaped like the beautiful cabbage that died last week. He wore a velvet jacket and he carried a camp stool and an easel on his back, and in his face was a curved pipe with a long stem, and his face was not red and rough like the face of Alexis, but mild and beautiful and with a smile that played on it like moonlight over putty. Do I love him? I cannot tell. Not yet. Love is a gentle plant. You cannot force its growth. As he passed I leaned from the window and threw a rosebud at him. But he did not see it. Then I threw a cake of soap and a toothbrush at him. But I missed him, and he passed on. Daniel Handler's introduction to the book—really more of a nonsense novel of his own—is also available for download. 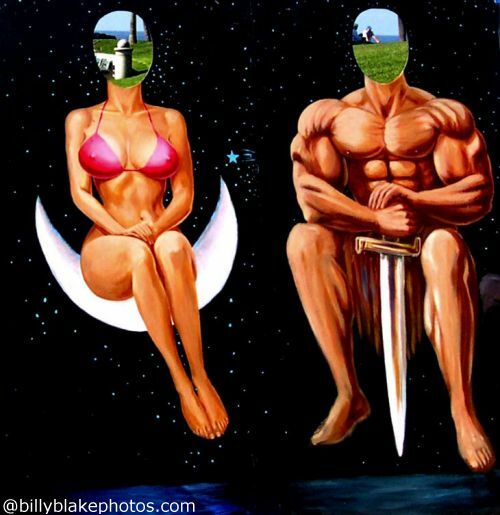 And it should also be mentioned that the artist who pays homage to Leacock on the cover of the book is another famous Canadian, Bruce McCall. what I would not have known, were I not a compulsive Wikipedia reader, is that the script is inspired by the Invention of Morel. which is a dynamic contrast to the black and white trappings of Marienbad, both visually and thematically. As the weather is supposed to be a bit dismal for Saturday, and Film Forum has coffee and fresh popcorn, I recommend you see both.